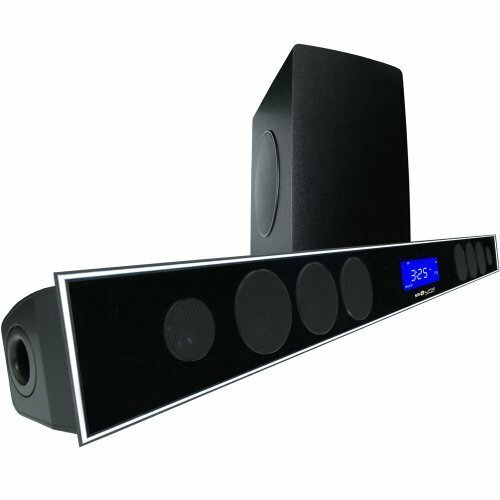 With the SA-TH5000 Sound bar you get amazing CD quality sound all while streaming wirelessly from your smartphone , tablet, etc.. This is due to the advanced Bluetooth technology chipset used in the SA-TH5000 Sound Bar. Finally true lossless audio quality without the wires. The 2.4GHz wireless subwoofer can be placed up to 50 feet away without loosing audio quality and pairs with no delay of the music source. Your ears won't believe there are no wires. MAXX BASS Technology - "Your ears will deceive you ." The SA-TH5000 Sound bar with wireless subwoofer incorporates the MAXX BASS technology. This chips algorithm was finely tuned by Sound Appeal engineers to optimally match the sonic capabilities of the SA-TH5000 Sound Bar and wireless subwoofer. Combine the MAXX BASS technology with a dual ported design and what you get is truly amazing low bass for a real life like concert experience. Your ears will deceive you . More is BETTER - More Drivers, more Power, more Inputs, more Controls. While other manufacturers skimp on adding more drivers, more power and more controls to earn more profit. Sound Appeal kicked it up a notch by adding more of everything. The SA-TH5000 features 6 mid bass drivers and two tweeters with a tuned crossover to insure clean bass, vocals and high frequency sounds with no hint of distortion. With a class D amplifier capable of delivering 400 watts of power to the subwoofer and soundbar, you might want to warn the neighbors that you are watching a movie tonight. Controls abound; with the remote control you can adjust system volume and even independently adjust subwoofer volume to insure optimal room acoustics. Change your sound processor from music, movie and or normal listening. Choose one of your favorite inputs;FM, AUX, USB, SD Card,Optical, Coaxial, or TV.